When you’re in college, things usually are already tight between having student loans you now have to pay, and then needing to balance work with academics. 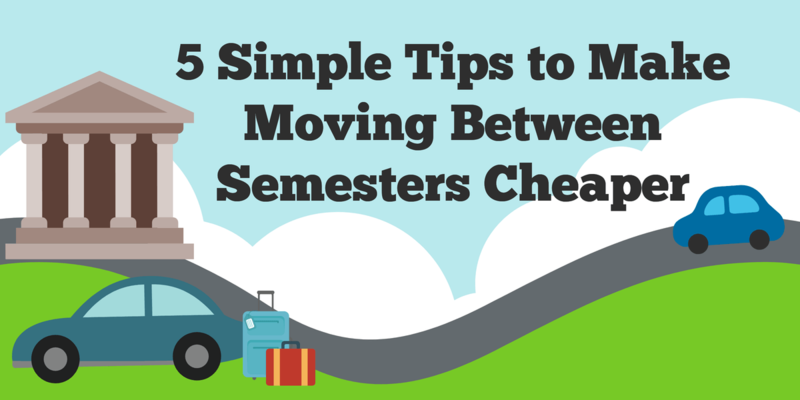 But, when it comes time to go home in between semesters, more costs come your way when you need to move things out of your dorm room that you may not want to take all the way home. The good news is that there are ways you could save money on college moves in ways you maybe hadn’t thought of before. Here are five tips you can try to save money moving. The fewer items you have to move, the better. If you do a check over all the items you’ll have to move, you may realize you no longer need some of them. You should sell them, not only to be rid of them, but also to have a little money to offset moving costs. This could include items like textbooks, old electronics, athletic gear or any other items you’ve accumulated over your stay in the dorms. Even if cardboard boxes are cheap at your local retail store, why spend any money for them when you can get them for free? You could ask around your dorm for used cardboard boxes that are no longer needed. Maybe a food services department or another place on campus brings in a lot of boxed items and throws away cardboard. If a cardboard box is still good, there’s no need to buy a new one. If you can’t store any belongings on campus, you can shop around for storage companies and look for discounts. Some may make special offers just for college students or military personnel, or you might have others offering storage as part of a moving company for a cheap deal. In some cases, you can even get a month free of rent if you sign up under certain terms. Just as sharing apartment and office space can be cost-effective, college students can share storage units to save money. Only this time, all you need to do when you share a unit is consolidate space and determine who will be primarily responsible for the lease. Depending on the company’s requirements, you both may need separate storage insurance policies. Sometimes you can save even more on moving if you’re able to avoid renting a moving van or truck. If you’re taking mostly smaller items to your storage unit, you could move them in multiple trips in your own smaller vehicle, and at a time planned in advance, so you don’t have to move all at once. If you do end up having to rent a moving vehicle, you could do a shared rental along with shared storage space to save money. There are always tricks to save even just that little bit of money for gas or food for a trip home when you use free moving resources in any way. One thing to keep in mind too is that the more time efficient you can be in moving planning, the more money you can save. Making a deal with a friend or roommate to share space can cut down on both costs and moving time.